Some time ago, when I was still watching television on occasion, I used to see a lot of commercials for a dried blueberry that was called "iki iki ai-beri". That last part means "eye berry". I've read that "iki iki" means lively, but the truth is that I never really looked into it. All I know is that the commercial was advertising a kind of special, extra juicy blueberry which was supposed to improve your eyesight. Hate your eyeglasses? Just eat those blueberries! Actually, they never made such claims, but they did imply them. Blueberries are supposed to be super healthy food. How do you take something pure and bursting with natural goodness and render it into junk food? You make it into candy. 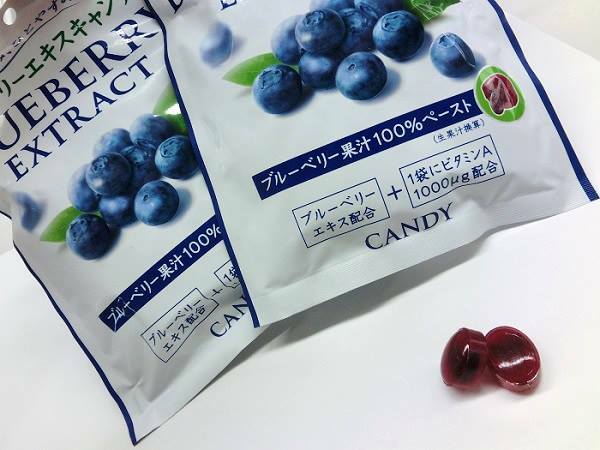 Kanro uses blueberry paste in the center of a hard candy to pack these candies with something which appears to be healthy but has probably been processed out of most of its real value. They recommend that you eat them at the computer at work and "relax". Personally, I'd rather sit at the computer and eat chocolate, but that likely won't improve my eyes or add the total amount of Vitamin A in my body.